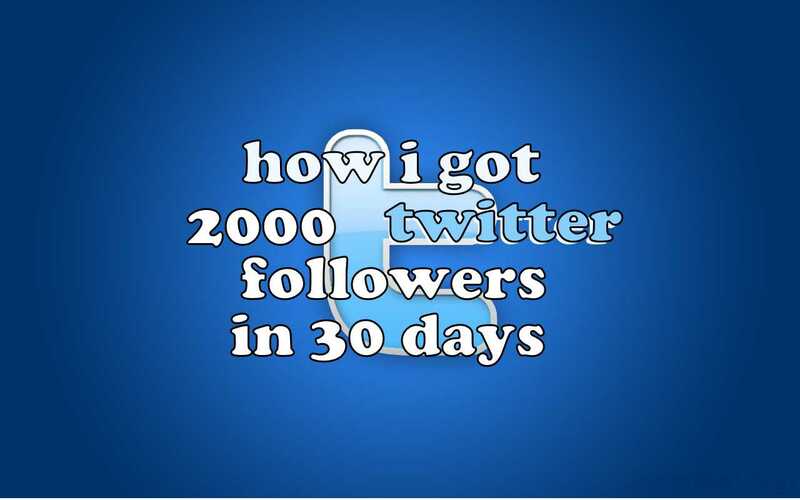 For those of you new to the site, I declared that I would start doing “30 days of Twitter Marketing” for the month of April. On April 1st, I started out with about 75 followers and by April 30th, I was over 2000. Over the course of the month, I had a number of Twitter Marketing specific posts and gave you some status updates along the way. I’ll add links for these at the bottom of the page. I think all are worth a read, but would suggest checking out the “avoid fake followers post” and the FAQ. Identify who your target audience is. For me, it’s writers. If you’re an author, search for potential readers of your book. The more specific you can find, the better. For example, If you write romance, that’s a big category, so dig in! Search for these people on Twitter. You can use hashtags, followers of someone who writes similar books, or even your own intuition. Start by trying to find the most specific first, as these are most likely to be interested in reading your book! Start Following! Follow about 200 people a day (more may make you look like a spammer). Wait for people to follow you back. Give them 3 to 5 days to follow you back. Interact! Be a real person. DM people, post pictures, respond to tweets. Don’t post constant “buy my book” tweets. See my recommendation in this post: The Worst Thing an Author Can Do Using Social Media Marketing. Stops me from accidentally following and unfollowing the same people. Following and unfollowing the same people over and over again is the fastest way to get your account banned on Twitter. It automatically keeps track of who I’ve followed using the tool and stops me from following and unfollowing the same people. Keeps track of my “unfollow” list. Since I wait 3 to 5 days to unfollow, it’s hard to know who I followed yesterday versus a week ago. TweetAdder takes the guesswork out of this by keeping track of when the tool first noticed I was following an account. I just check a box that says show me people that haven’t followed me back in X days. I can easily set this to 3 and start unfollowing them! Allows me to build a “Follow later list” – my search for followers might get 3000 people. Since I try to follow 100 to 200 people a day, I don’t have to redo my search every day. The list is kept in TweetAdder, so I just open the tool each day and follow 100-200 people! Saves me time. Probably should have led with this one 🙂 Even with the TweetAdder 4 Update, I can do all my follows and unfollows in about 2 minutes a day. WAY better than 30 to 45! It has many other features you can read about on the TweetAdder site, but it’s very easy to use and will save you a lot of time. If you don’t have money for the product, that’s ok! The tradeoff is your time. Update: I’ve published a video of how I use TweetAdder 4. It’s still amazingly fast and saves me me hours of time. More proof that this really works! I had no problem building my Twitter list pretty quickly. If you’re serious about building your Twitter audience, it’s easy to do and the above proves it! When you start running into Twitter’s “following limit of 2000” (Twitter stops you from following more until you have enough followers to justify it), it’s the most critical time to unfollow people that are not following you back. Wouldn’t you know it, that’s exactly where I was when TweetAdder version 4 was released…I was having problems with the tool crashing and had to reset my account (which reset the number of days for the unfollow). Long story short, headache that I’m still dealing with. That being said, I was still able to get a good list of 2000 followers and keep moving forward with building a Twitter Audience 🙂 Update: I’ve published a video of how I use TweetAdder 4. It’s still amazingly fast and saves me me hours of time. So, that’s it! I still have a few more Twitter marketing gems I’ll share over the coming months. For the month of May, my focus will be on showing how to do some basic Facebook and Google+ marketing. If you found this article useful, please comment below and/or click the “Like” button and share it on your favorite social marketing sites. Posted in Featured, Marketing, Techniques to Market This Site, Twitter and tagged twittadder, Twitter, twitter marketing. You’re definitely not alone – most authors want to opt for the “splendid isolation” option. It is so hard to get comfortable reaching out to people, but it’s actually a lot easier doing it online. Definitely don’t get overwhelmed. Just focus on one thing at a time and keep doing it until you feel really comfortable with it! Even if it takes 3 months or even longer on one social networking site (like Twitter or Facebook), it’s better to really “get it” than try to do 20 different social networking sites at the same time. You’re Twitter advice what I need at this moment as I’m struggling with working smarter and not harder, and maximizing the results. Currently, I’m frustrated with the results of all the time and effort I’ve put in developing relationships on social media and the impact this is having on my writing time. I realize a certain part of the social media marketing is a numbers game, once the audience is targeted, but I’m still a bit disillusioned. However, I never, ever give up. So, I’m going to try your methodology and see what happens, can only be better than what I’m doing now. Thanks for the help, Mike. Hi Cat! You’ll be amazed I’m heading out on vacation out of the country (with little to no Internet access) and will be back the 27th. Between now and then, I would bet that you will get at least 500 followers in that time! I’m looking forward to hearing back from you – so please let me know how it goes!